The cycling movement in this country is gaining momentum, yet it's still predominantly male. So how do we get more women on bikes, and help females to feel more comfortable riding for transportation in their daily lives? Author Elly Blue is joining us today to talk about women and bikes. As part of our Bike Month coverage, we've talked to a bike lawyer about the rules of the road, and the clothing company Outlier about how to commute in style. Today we're chatting with Elly about making biking safer and more inclusive for all. Elly is an author and publisher with a focus on feminist nonfiction about bicycling. 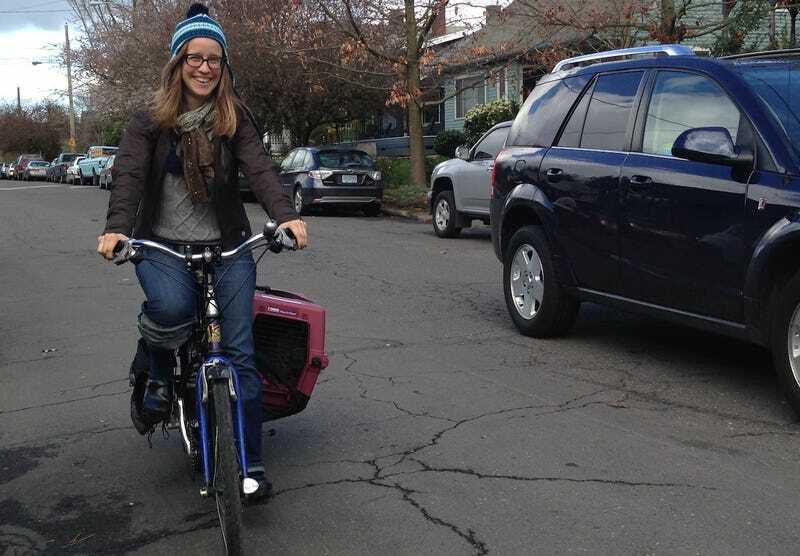 She publishes the quarterly zine Taking the Lane and has written many books on biking. Earlier this week, we excerpted a chapter from her book Everyday Bicycling: How to Ride a Bike for Transportation (Whatever Your Lifestyle) on how to buy the right bike. Elly's here today to answer your questions about women and biking, from lady-specific gear recommendations to ways that cities can make biking safer for females. Although the focus is on women, we're also happy to address any questions from men who are looking to get started on two wheels. And yes, that is Elly in the image up top, biking her cat to the vet. Thanks Elly for joining us! If you still have a question, feel free to drop it below and she can stop back by when she has time. Follow her at @ellyblue.